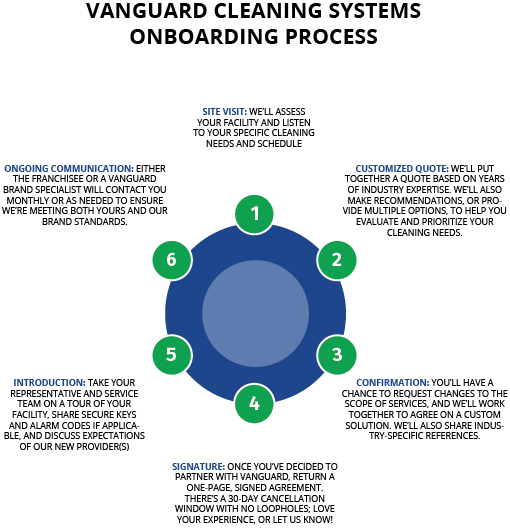 Every person at Vanguard Cleaning Systems of Minnesota—whether an owner, franchisee or employee—strives to ensure our customers’ satisfaction. After all, you have more important things to do than worry about the cleanliness of your building – that’s our job. Through our commitment to a set of core values in everything we do, from office cleaning to volunteering in our community, we’ve empowered a team of efficient, professional and dedicated individuals that are passionate about helping make your job easier. Try us and discover The Vanguard Difference – “Every Customer. Every Day. Every Time. No two businesses are alike—so why should their cleaning services be exactly the same? Vanguard employees and franchisees provide solutions that will fit your schedule, your facility, your budget, and the ever-changing needs of your organization. We’ll listen to your needs, customize the scope of work, and adjust over time so you get exactly what you want long-term. We work hard to promote a professional relationship between our team members, franchisees, and clients—from start to finish. But the key to solid communication and understanding is a direct relationship between franchisees and the client. It works! Issues get addressed quickly without the middleman. At its core, our brand is built on service. From serving our franchisees—so they can grow their businesses and become more independent—to volunteering in our communities and financially supporting franchisees’ service projects, we take an others-centered approach that goes far beyond providing excellent cleaning services. Vanguard is deeply committed—at all levels—to helping people thrive.